25 posts. Interested candidates are advised to go through CanFin Homes official website www.canfinhomes.com and read the advertisement carefully. Submit the filled applications through online is 23-11-2017. 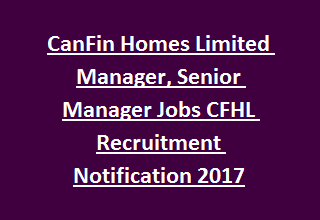 Selection of candidates applying for Manager & Sr Manager Jobs in Canfin Homes Limited Recruitment is based on Interview. Interview details will be informed to shortlisted candidates through e-mail. Pay Scale for Manager Jobs is Rs. 28,000/- to Rs. 43,450/- and for Senior Managers is Rs. 33,300/- to Rs. 47,700/-. Qualifications required for Managers is Graduation degree in any discipline and for Sr. Managers is Post Graduation degree in any discipline. For further details of Qualifications, Post Qualification Experience, Age limit & Relaxations, Salary, Selection procedure, application procedure of CanFin Homes Limited Recruitment Manager & Senior Manager Jobs are stated below. Interview dates will be send by CFHL directly to your mail id or mobile number. Total available vacancies in Canfin Homes Limited Recruitment are 25 posts. Managers: Any Graduate degree with 60% marks from recognized University/ Institute. Preference will be given for higher qualifications. Senior Managers: Any Post Graduate degree from recognized University with 60% marks. Preference will be given for MBA and other Professional qualifications like CA/ ICWA/ LLB. Age of the candidate for Manager posts should be below 30 years and above 25 years as on 01-11-2017. Age limit for the post Sr Manager is 28 years to 35 years as on 01-11-2017. Selection of candidates applying for Manager & Sr Manager Jobs in Canfin Homes Ltd Recruitment is based on Interview. Short listed candidates will be published in the Company website www.canfinhomes.com. Interview date & time will be informed to the candidates through E-mail. Application fee of Rs. 100/- remitted through Internet Banking/ Online Transfer/ NEFT/ RTGS. Other details are mentioned in CFHL Notification. Eligible candidates are required to go through CFHL official Web link http://www.canfinhomes.com/job and read the instructions to fill the application. Log on to the above link and complete registration process. Upload the online application along with photograph, signature and application fee payment proof before 23-11-2017. Apply online for Manager, Senior Manager Jobs in CFHL Recruitment 2017.